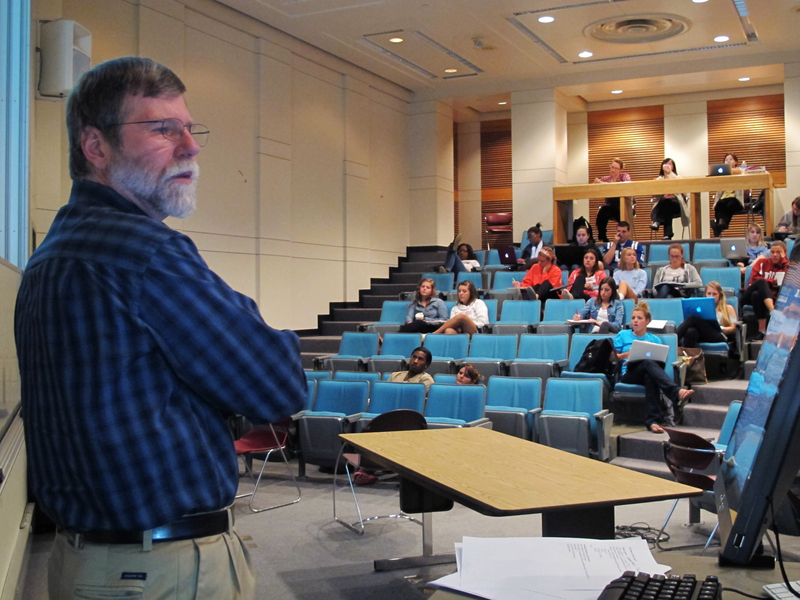 IU School of Education professor Peter Kloosterman speaks during his class, designed to instruct future elementary school teachers how to teach math. With Indiana’s statewide teacher evaluation mandate taking effect this year, some state lawmakers say they want those ratings to reflect not only on teachers but on where they went to college. “It’s my belief we probably have some schools of education or colleges that are good, and some that aren’t as good,” says Sen. Jim Banks, R-Columbia City, who introduced legislation this year that would’ve given ratings to teacher preparation programs based, in part, on their graduates’ evaluations. Though lawmakers will not begin rating ed schools this year, the version of Banks’ bill the Indiana House passed Monday calls for a legislative study committee to continue the discussion and for the State Board of Education to enact a grading system for teacher preparation programs by 2016. While some college administrators see drawbacks to a rating system, the proposal also could be a means to get them something they’ve long sought: data on their graduates’ performance. 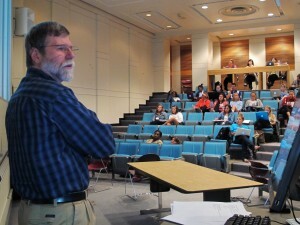 IU School of Education professor Peter Kloosterman refers to a computer screen during a lecture. During this class, he's showing videos of elementary school students doing math programs with researchers. The difficulty, Indiana University School of Education dean Gerardo Gonzalez believes, will be in creating a rating system that “adds value” to the discussion of which teacher preparation programs are producing the best graduates. “We all in education, certainly we here at IU think accountability’s a good thing, and we ought to do it, but we ought to do it right,” Gonzalez says. Indiana’s teachers colleges have long sought access to state data on their graduates’ performance, especially as the state’s new teacher evaluation mandate promises to create troves of data on how well they perform in the classroom. Banks proposes to take the ed schools’ proposal to access the numbers a step further. He proposed Senate Bill 409, which — as it passed the Senate — would’ve linked nearly all teachers’ evaluation results to a rating system for Indiana’s teacher preparation programs. The Indiana House has since amended the bill to send it to a study committee, requiring the State Board of Education and Indiana Department of Education to develop benchmarks for a rating system for ed schools by 2016. But the Senate’s version would have set up a rating system that included this benchmark: 70 percent of an ed school’s graduates would have to earn either “Effective” or “Highly Effective” scores on their teacher evaluation within 3 years of graduation. House Education Committee Chair Bob Behning, R-Indianapolis, says he hears from local school administrators that teachers are arriving unprepared in their classrooms. 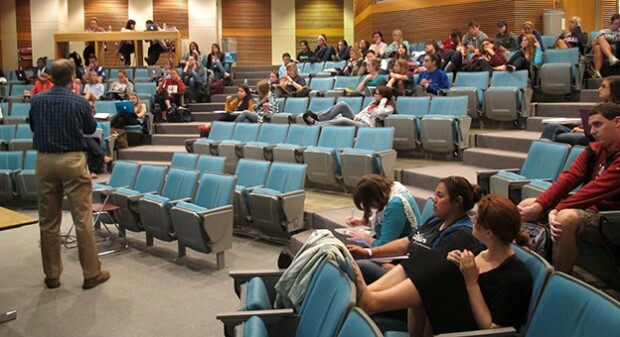 Some of our schools of education are spending more time teaching future teachers pedagogy and things that are useful in the classroom, but not giving them the content knowledge they need to be successful as well. Frankly, you need a balance. Studies show that students who come from a content-knowledge base — especially in the education world — than those who only have a pedagogy base. I believe you need to have both to be able to be successful today in the classroom, but you have to have your weighting on the content knowledge. I think different schools of education do that differently. Should Indiana Teachers Be ‘Experts’ In The Subjects They Teach? With ‘REPA II’ Licensing Rules, What Is The Value Of An Education Degree? Does Data Speak Louder Than A Rating? The question for teacher preparation programs is what teaching skill the state-mandated evaluations are rating. Kloosterman says he has plenty of anecdotal evidence on how well IU education majors perform once they enter the teaching profession — from exam scores to the ratings mentors give their student teachers. But Kloosterman has fewer hard numbers about IU’s graduates. I couldn’t understand what the purpose of having the state then rate the programs based on these data that the legislation would require us to report and collect… The rating itself seems unnecessary. I don’t mind reporting the data. If we’re able to identify a set of indicators that really speak to the relative performance of various schools of education, then we should just make those data available. If people want to know what is the average GPA of students coming into the school of education, we can report that. If people want to know what is our graduation rates of those who enter our program, we can report that. Whatever the indicators are — our pass rates on exams — if it’s of interest, we can report that and we do now report that to the federal government. Banks says lawmakers haven’t ruled out implementing a rating system at a future date. He says it’s possible that rating system could eventually have consequences for schools of education, perhaps linking their accreditation to a rating system. “If you look at the earliest versions of the bill, that’s exactly what it did… If we can rate them and expose where the good ones are and the schools that aren’t as good, at the very least, if we can expose that, then we can address the problem and maybe call for some of those consequences later,” Banks told StateImpact. If that day comes, Kloosterman says he’s confident the IU School of Education would perform well under a rating system. “If our students don’t meet the standards, everybody’s going to fail. They’ve got the best preparation and the best background to begin with, and when you’ve got that, it’s really easy to have them meet the standards,” Kloosterman says. UPDATE, 5:30 p.m.: The Indiana House passed an amended Senate Bill 409 by a 79-10 vote. We updated this post to reflect the approved bill.